Stress your brand to potential clients with these USA-made giveaways! 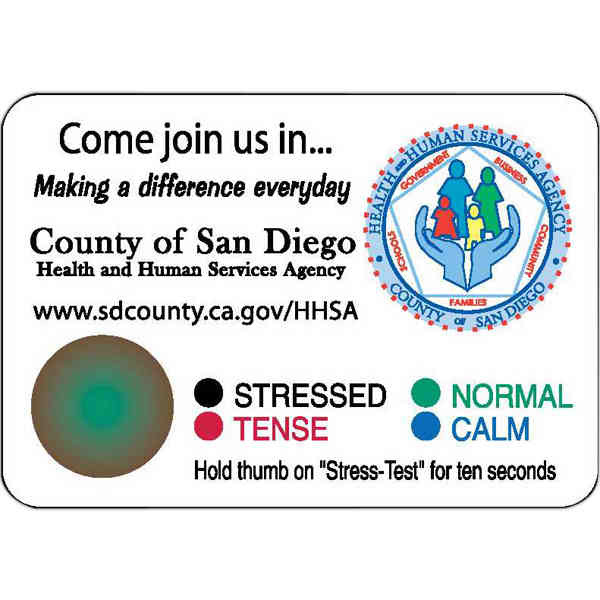 A cost effective tool to get your message across, these Stress Test Mag-Rites™ are great for any stress management program. Each magnet is made from white flexible, non-toxic material, features rounded corners, a thickness of 17 mil. and contains a stress-test indicator. You get to choose the location and related copy. Customize each magnet with your logo to increase brand recognition. Will accept ballpoint pens or any permanent marker. Designed for indoor use only. Each test includes a circle or heart indicator attachment. This marketing tool is sure to pass your promotional test! Size: 1 13/16 " x 2 5/8 "
Price Includes:Process Color (CMYK) printing. Imprint Size:1" x 2 3/8", 3/4" x 1 5/8", 1 1/2" x 1 5/8"